School Leadership is now an education policy priority across the world. Educators, principals, headmasters, head teachers, and school management can get all the skills and development certifications to add stars to their portfolio, but one thing that requires an immediate attention is their leadership skills. School Leadership is often ignored, despite several observations that effective leaders influence school teachers positively and generate better outcomes from the school. Effective school leadership is essential for an efficient school setting that promotes equity. 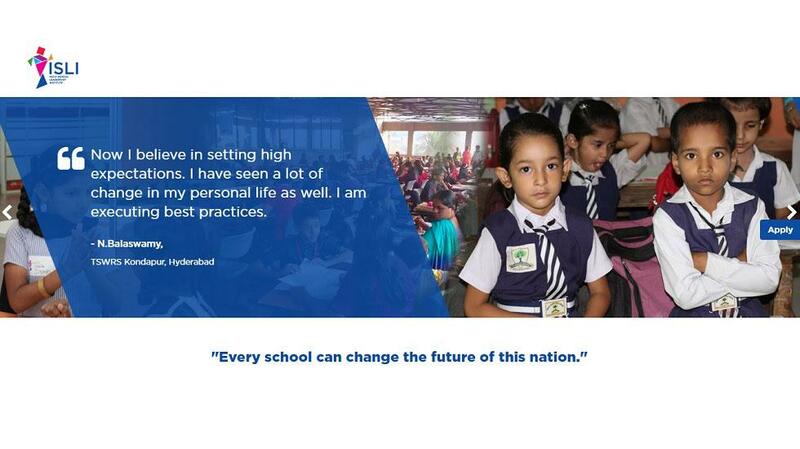 Realizing the importance of School Leaders, an organization called India School Leadership Institute (ISLI) helps schools across the nation to enhance their leadership skills, thereby improving the quality of the school altogether. At ISLI, they believe that all schools should offer exceptional educational opportunities. To this end, they seek to create a generation of exemplary leaders who can guide their schools towards a new environment of excellence. According to them, “By improving standards within their schools, School Leaders can improve parent satisfaction, teacher retention, student performance, and enrollment”. The ISLI City Fellowship is aimed at helping School Leaders develop and improve leadership skills over a 2 year programme and beyond. As of now, the ISLI City Fellowship is offered in 448 schools across 4 cities, impacting more than 2.5 lakh students. This training programme’s core is the student benefit, and so the training programme has 4 key aspects keeping the same in mind. The ISLI programme is a combination of workshops and in-school support. The workshops are meant to enhance the skills of the practitioners; and in-school support helps to Identify specific areas of school improvement, implement solutions and derive results. The workshops include sessions that help the school in lesson planning, improving school systems, better classroom management, instilling the art of leadership and student engagement. The highlight of these workshops is that they are instruction-based and not theoretical to ensure that the benefit is translated from words to action. These workshops are planned as per the school leaders’ convenience. Apart from the above-mentioned activities, ISLI Programme Managers conduct regular visits to ensure that the programme is executed smoothly and is generating the necessary impact on the school. Explore more from their case studies. - Improvement in school practices at all levels: School management and leadership are improved. Teachers show higher attendance and their skills in lesson planning improves thereby resulting in higher engagement levels in the classroom and improved student learning. - Schools set higher standards for themselves: With things in place and a leader willing to adapt and support the necessary changes, there are higher expectations from teachers, ownership for their growth and the development of shared leadership. Students perform better which in turn will make parents more involved in the school. - More respect and recognition in the community: A transformed school translates to an increasing number of parents being favorably disposed to the school. Also, the recognition and respect help in brand building across the community. - Growth of the school: Rise in the number of students helps in the expansion and progress of the institution thereby again making your institute a brand. To be a great leader the willingness to upgrade, to learn continuously, and to be open to change are mandatory. John Kennedy once said, “Leadership and learning are indispensable to each other” and rightly so. It is never too late to learn, grow and become a better version of yourself. To know more about India School Leadership Institute, visit theirwebsite. Or click here to apply for ISLI Fellowship programme.